Against a landscape harsh and redemptive, 10 year old Judith McPherson joins the ranks of Scout, the characters in Room, Charles Dickens’s orphans – the list could go on forever. Unforgettable and crystallized within her own poetic world, Judith emerges both vulnerable and vastly courageous. And she’s simply one of the best fictional characters to take over a blinding novel in a long time. Judith’s mother died in childbirth, as her evangelical religion disallowed her from a blood transfusion that would have saved her life. Judith’s father, consumed in a caul of grief, trying desperately to keep his job, and contain the vestiges of his shaken faith in a fanatical religion that caused him to lose his wife, does the best he can. Judith, caught within the End Times that her church claims is imminent, travels into her room and her imagination to stay alive. Within her room, she creates her Land of Decoration, a manifestation of the tangible world around her and the universe that her god created, to counter the Armageddon that will come – soon. Shunned and abused by her classmates, who consider the proselytizing evangelists scum, Judith discovers one day that by placing “snow” in her room (cotton balls over her landscapes) she can make it snow outside and escape school, where she is being bullied by a boy, Neil, who pushes her head into a toilet. Her new teacher Mrs. Pierce, wants to rescue Judith, and tries hard to make school bearable for her, but Judith is in the hands of her evangelical god, as well as God her communicator in miracles. Judith holds fast to her gift of creating miracles in her room, and begins her conversations with God, who pushes her to obey his wishes. God says that he will continue to grant her the magic of miracles within her Land of Decoration if she does what he says. As snow continues to fall outside, Judith decides to pull the cotton balls away from her room landscape, as a test of her abilities to stop the snow outside. And the snow stops. She talks to God about it and believes that the miracles come from him, and can only be created in her room. Stunning, electrifying, existential, mystical and so true to a child’s imagination that it hurts, Judith faces down good and evil as her father struggles to stay alive. Sometimes a novel is so good that there are no words to do it justice. The Land of Decoration assumes the metaphor for a child living for death, while pursuing life, and trying to find her father’s love in the meantime. Throughout this brilliant novel, Judith holds us in her hands. At the end, McCleen and Judith let go of the dove and the novel soars, while we trail behind in awe. 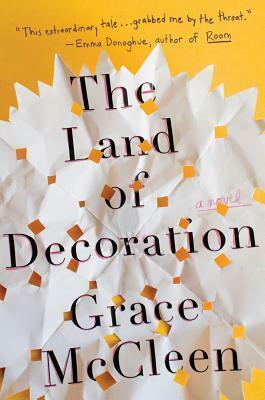 The Land of Decoration is available for purchase at bookstores nationwide.